The Minnesota Food Charter Food Access Planning Guide provides tools, resources, proven policy strategies, and recommended planning and zoning language for comprehensive plans, so planners and community food advocates can collaborate to design communities that promote access to healthy, safe, affordable food. 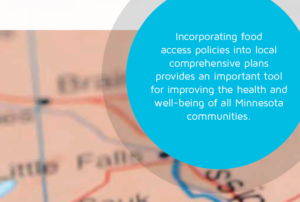 Make sure healthy food access and equity are part of your community’s long-range plan by leveraging the new Minnesota Food Charter Food Access Planning Guide. This toolkit can help! Simply enter your information below and you will automatically be taken to a link to download the toolkit.